Bert: My next guest is Attorney Eric Blank … Who Focuses his practice on representing plaintiffs in personal injury and workers compensation actions. Before opening his current practice representing plaintiffs, he worked in insurance defense defending insurance companies against claims asserted by plaintiffs. This experience provided Mr. Blank with a unique insight into how insurance companies evaluate various types of claims and the strategies they employ to defend them. He also gained extensive business experience acting as general counselor for local NBC and FOX affiliates. Eric Blank, welcome to Money For Lunch. Eric: Thank you, Bert. How are you today? Bert: I’m doing great, man. Doing great. Enjoying … Our heat. I think you mentioned you’re in Nevada … Where? Are you in Las Vegas or are you up north? Eric: I’m in Las Vegas. Oh, yeah. We’re resting in about a cool 108 today, I think. Bert: Yeah … Whew. 108 sounds great, but not as bad as 115 or 117 or whatever it was last week. Yeah, we’re enjoying this cool breeze. All right, let’s talk about this. 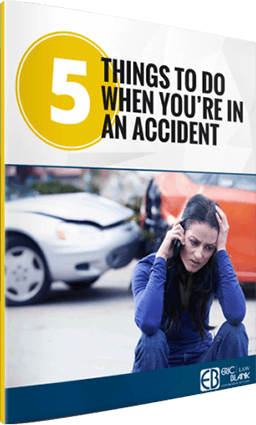 Let’s talk about what to do when you’re in a car accident. You have ten questions … You have a ten step process, if you will. Let’s start off with number one. Number one is to document the scene of the accident. What do you mean by that? Eric: When an accident happens, there’s a lot of things going on. If there’s people in the car with you, you want to check on their well-being. You may be at a busy intersection, cars are honking, there’s a lot of noise going on. It’s very important to document the scene because an hour later, a couple days later, a couple years later … As your case develops, these crucial moments happen at that time. What I’m talking about is taking pictures of the accident scene. First off, make sure you’re in a safe area. Don’t start getting out in the middle of a road and start taking the photos … It’s best if you don’t move your vehicle so the police officer can see what’s happening, but if you do need to move your vehicle, move to a safe area and document as much as you can. The good thing these days with smartphones, you can take pictures of the other person, you can take pictures of the vehicles, you can take pictures of any debris, licenses, registration, and insurance. Bert: Yes. On top of that, you can also do a video. I mean, you could literally walk around and videotape everything. Yeah, I like that idea. What a great use of technology. You mention insurance information. Let’s talk about this. Contact information, insurance information from the parties … What happens there? I mean, let’s say that we’re in a car accident. I’m in a car accident with another party. By law … We are supposed to exchange information or do we wait for the police? What’s the status on that? Eric: Well, I like to advise to wait for the police, but that’s not always practical. If you can do an exchange without the police there, that’s great as well. You dovetailed into a perfect segment there or issue. You definitely should call the police. Here in Las Vegas, there was a period of time where the police were not reporting to what was called non-injury accidents, which is foolish only because a lot of times in personal injury accident cases, the injuries you suffer don’t become apparent until hours or even days later. You have high adrenaline and you’re not aware of all the injuries going on. Ideally it would be an officer to help facilitate the exchange because sometimes unfortunately, the people will give you false information. Bert: Sure. Something else that occurs too … Back to documenting the scene with your smartphone … Our memory starts to, what do you call it, fade immediately. Eric: Bert, I can’t tell you how many times I have clients say that there was a witness there or this person. If you don’t get it at that moment, they’re gone. They go … “Oh, the police officer will have their information.” Rarely does that happen. Bert: Well, absolutely. First of all, look, if you are a witness, you may not have a bunch of time to wait around for the police. You might be intimidated by the police. You have all sorts of reasons not to hang around there … As you mentioned earlier, document everything. Again, today’s smartphone … There’s a way of recording a voice, even if you use your video camera and covered up the lens, you could still record a voice. There’s always ways to use your smartphone for that. Bert: Okay, so let’s talk about the police report. Does a police report … How do I go about getting that? How long does that take? Eric: Okay. Depends … Here, at least in Las Vegas, it depends on what part, where your accident happens. If it’s our Las Vegas Metropolitan Police versus Nevada Highway Patrol versus Henderson Police or North Las Vegas, each department, I would say anywhere usually from five business days to ten business days. It would be available at that point. We’re charged to get those documents, but what’s important about these documents are several items. Number one, it should have a narrative of the accident. It should have who the involved parties are and the insurance and policy number information on those. Now police reports on their own, at least here in Nevada, are not admissible in court. The officer, him or herself, giving their recollection of the events based on the police report is admissible, but the police report’s not, however, it’s a very useful tool for the insurance companies and for us to help assess liability early on. Bert: Sure … I want to ask you this because a lot of people think that, hey, if it’s in the police report, that’s gospel. That’s the only way. The police report, I want to say, is probably right a lot of the time, but not always. Would you agree with that? Eric: Oh, you’re absolutely correct. Listen, these officers, they have a tough job. I mean, they come to an accident after it’s happened for ninety-five plus percent of the time unless they happened to be just passing by and see that, but almost all the time, they’re arriving after that. They have to determine what went on based on different people giving their accounts. They have a number of accidents they have to handle on a given day. It’s not just this one and they’re going to remember that two years later and if they have to give some kind of testimony on it. There’s definitely not gospel in there. That’s why it’s important upon reviewing a police report, you do have an opportunity as a party to an accident to provide your own supplements … It’s more effort. You have to go to the station and fill out documents, but it’s definitely possible and I highly recommend that only because these police reports will follow you throughout the case. Bert: Absolutely … Yeah. It’s like you said. It’s a starting point. It’s something that the insurance companies use to try to determine liability. Okay, let’s talk about this: “Avoid insurance tricks to devalue your case.” Talk about that. Eric: Well, insurance companies, let’s be clear. I mean, they’re multi-billion dollar corporations. They’re not stupid. I mean, they’re very sophisticated. They have not milled themselves up by accident. Their goal is to minimize their risk for their insured, okay, and to make money. It’s sort of the same question, but as you know, much more leading one way. I’m leading you to an answer I want … Never, never, never give a recorded statement unless you’ve already talked to your representative first. So many clients give a recorded statement before we get to them and we work on minimizing those, but sometimes the damage has been done in those statements. You can get them potentially thrown out, but you’ve just put yourself a little bit behind the 8 ball. It’s not fatal, but it’s something you’d rather not have to deal with. Bert: Yeah. No, absolutely. It’s just one of those things where … It’s just being cautious. Err on the side of caution. Nothing’s going to happen to your case if you don’t give the statement, correct? Eric: Yeah, correct. Absolutely … I need to make a slight distinction. With your own insurance company, there is potentially language in there that you have a duty to cooperate with them regarding an accident. However, if it doesn’t happen in that moment, if you do it within a reasonable time after especially with counsel like myself or another qualified attorney on board, we can help steer the questions, make sure that it stays within the realm of this accident and doesn’t start veering into areas which the insurance company has no right to ask you about. Bert: Right … Let me get your opinion on this. Let’s say that you are dealing with your insurance company. Your insurance company says, “Hey, you know what? We need to get a recorded statement.” You can simply say, “You know what? That’s great. I want to give you a recorded statement. Let me talk to my attorney first.” Nothing wrong with that. Bert: Absolutely. Eric Blank, we’re out of time, but I’d love to bring you back and talk more about personal injury and what to do with it. Eric Blank, thank you so much for stopping by and sharing. Eric: Bert, thank you very much. I appreciate that … If I’m able to give out a number there, if anybody has any further questions, can I give a number out on the air for people to reach us? Eric: Sure. We’re located here at 702-222-2115. That’s 702-222-2115. We’re online at ericblanklaw.com. Bert: All righty. Good stuff there from Eric Blank. What a great name … Eric Blank. You can just fill in the blank. No, I’m just kidding … I’m sure he’s heard them all, but anyway, just a great name. 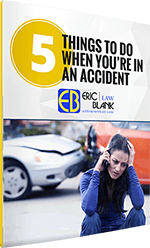 Great, great suggestion, great tips and strategies on what to do with your personal injury case. We’re going to take a quick commercial break and then we’ll be back right after this.